Safety and common sense are the first things to keep in mind when using home remedies and herbs to treat small children and babies. Kids are not just miniature adults, their still developing bodies are more sensitive making them more apt to experience unintended side effects. Even when using herbs that have a proven safety record, be careful when first giving a new herb, just as you would any new food to test for allergies. 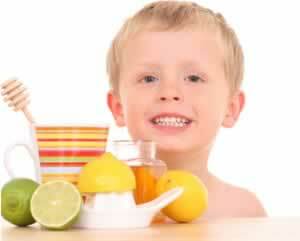 Glycerin based extracts and herbal teas are well tolerated by children and the infirm. A good rule of thumb for children under the age of 13, is to reduce dosages to half that of an adult dose, and continue to reduce by age and weight. Most children's remedies mentioned here are for common illnesses, diarrhea, tummy aches, teething, colic, colds and bed-wetting. 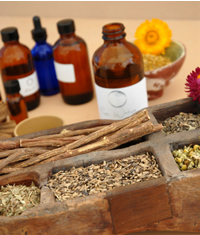 If you intend to treat any long term, or serious condition, consult with a qualified herbalist and/or medical practitioner. Bedwetting and diarrhea:Agrimony has an astringent action on the bladder and is used for control of bed-wetting in older children, and may help to control incontinence in adults as well. Sip a cup of Agrimony tea slowly before retiring to bed. Meadowsweet is a specific for diarrhea in children, it's astringent action combined with nutritives makes it safe, mild, and effective. Use a generous amount of sugar or honey else the bitter taste can make it harder to get children to take it. raspberry tea is an effective and safe remedy for children, and is given to reduce fever and calm diarrhea. A good tonic herb with a rich supply of vitamins and minerals that help build strong bones and general good health. Generally considered safe, with no unwanted side effects. Colic, gas:Basil in considered a safe and gentle tonic for nursing mothers. Taken as a tea, it helps to expel gas in infants and increases lactation in the mother. Chamomile is also effective. Distilled Caraway water is considered a useful remedy in the flatulent colic of infants, and is an excellent vehicle for children's medicine. Dill Water, which is a common domestic remedy for the flatulence of infants is a useful vehicle for children's medicine generally. Spearmint relieves gas and tummy troubles, much like peppermint, but its effects are less powerful, making it better suited for use in children. Hot chocolate may actually be a more effective cough medicine than traditional remedies making it a safe nighttime calmer for children. Turmeric and hot milk can also work safely and well. Maud Grieve. "Modern Herbal Volume 2" Harcourt, (1931) An effective and safe remedy for children, raspberry tea is given to reduce fever and calm diarrhea. A good tonic herb with a rich supply of vitamins and minerals that help build strong bones and general good health. Generally considered safe, with no unwanted side effects. Maud Grieve. "Modern Herbal Volume 2" Harcourt, (1931) Yarrow opens the pores freely and purifies the blood, and is recommended in the early stages of children's colds, and in measles and other eruptive diseases. Maud Grieve. "Modern Herbal Vol 1" Harcourt, (1931) It is good in restlessness, colic, insanity and nervousness, and is used as a mild nervine for children, one of its chief uses being, indeed, in the treatment of children's ailments. An injection of Catnep Tea is also used for colicky pains. Adele Dawson. "Herbs: Partners in Life" Healing Arts Press, (2000) Meadowsweet is a specific for diarrhea in children, it's astringent action combined with nutritives makes it safe, mild, and effective. Weiss, Gaea and Shandor. " The Healing Herbs" Rodale, (1985) Basil in considered a safe and gentle tonic for nursing mothers. Taken as a tea, it helps to expel gas in infants and increases lactation in the mother. Weiss, Gaea and Shandor. " The Healing Herbs" Rodale, (1985) Linden flower baths have been used for centuries to treat hyperactivity, insomnia and anxiety. It is said that linden flower baths can calm irritable or restless children too.